Sheetala Mata is believed as the Goddess of diseases and epidemics. The fair which is organized is just to pay her respect and pray to her so that people can stay away from diseases and epidemics. The Sheetala Mata fair is organized every year in the month of March or April and according to the Hindu calendar in the month of Chaitra. 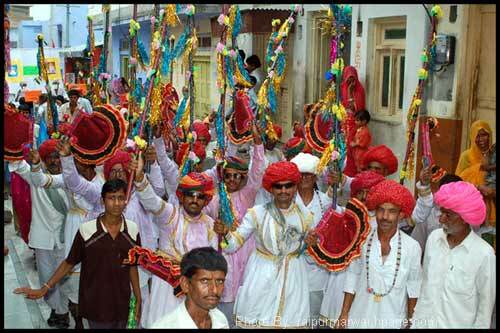 The fair attracts thousands of visitors from all the cities of Rajasthan as well as the neighboring states. People believe that epidemics spread because of the anger of Sheetla Mata and hence they worship her and make offerings so that she may be pacified. People offer sweets fruits and cash as offerings at the shrine. A red stone represents the deity. It is a veritable picnic for the pilgrims attending the fair. It is customary to cook one’s own food at the site, and eat it only after it has been offered at the shrine. A brief market comes up at the fair and the rural folk can be seen trading in wares such as shoes, clothes, foodstuff, utensils and agricultural implements A cattle fair is also organized during the event. Cattle are decorated to attract the buyers and to get good price of them. As one Sheetla Mata temple is also located in Dhanop village near Bhilwara, many people visits this temple also. Here goddess Sheetla mata icon is of black stone with patches of sindoor(vermilion) on it. A neem tree in the temple looks colorful as many people tied colorful pieces of cloths to fulfill their wishes by the goddess. But the major fair celebrated on the Sheetala mata shrine. This shrine is locates at top of Doongri hillock. This hillock is in the village of Seel-ki-Doongri village. This village is just 5 km from Chaksu, the district headquater and 35 km from Jaipur. Sheetala mata fair in 2014 will be celebrated on 24 March 2014.